We’ll let the picture tell the story: The carrier Theodore Roosevelt got underway Saturday for the first time in nearly two years when it left its dry dock at Newport News Shipbuilding and entered James River in southeast Virginia. 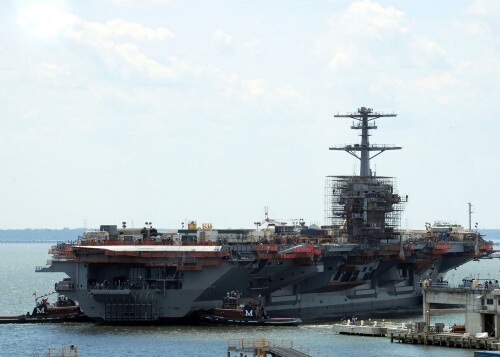 The move comes in the midst of the carrier’s ongoing 39-month refueling complex overhaul, which began in August 2009 at Newport News, a division of Huntington Ingalls Industries. The work aims to add another 25 years of life to the nuclear-powered carrier, which was commissioned in 1986. The carrier was pushed by five tugs during the very short, yet very slow, evolution. “It’s like watching a cloud move,” said Lt. Cmdr. Karen Eifert, the carrier’s public affairs officer. The short trip, however, required a lot of planning; the carrier’s quartermaster team had been training for the movement since March, according to a Navy news release.